We know that Mrs Ann Richards bought two of the six properties that were built by Joseph Parslow. The deeds of 40 Castle Street include an indenture for the sale of that house by Thomas Morgan to John Powell in 1812. In this document the house next door (number 42 Castle Street) is said to be a “dwellinghouse late of him the said Joseph Parslow afterwards of Ann Richards and now of him the said Thomas Morgan in the occupation of Martha Knapp”. It would seem that number 42 either had the added advantage of having its own well or at least had the passageway allowing others to access it. 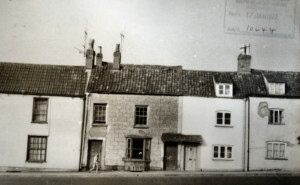 The photograph above shows the house in the 1960s. It is the house on the left. It has a small door on the left as well as the front door on the right under the shared porch. It seems likely that this was the door to an alley way which gave access to the common well. We have been unable to trace any records of Mrs Richards and very few of Thomas Morgan, the earliest known owners of the house. In the Tithe Apportionment Survey Map, drawn up between 1837 and 1840, the house was given the tithe number number 285 and it was said to be owned and occupied by Martha Knapp. We have been unable to find any further trace of Martha Knapp. The 1851 census shows that the house was empty. Alfred Harvey. In the 1861 census the house was occupied by Alfred and Caroline Harvey. Alfred was the High Bailiff of the County Court of Gloucester. He was aged 37 from Westbury in Gloucestershire (this appears to be Westbury on Trym) and Caroline was aged 36 from Bristol. Their four children were born in Thornbury. Edward was aged nine, Ada aged seven, Louis aged four and Frank two. When Edward was baptised on 14th April 1852, Alfred Harvey was an accountant. They had some people staying in the house in the 1861 census. Elizabeth Harvey Greenway aged 38 was the wife of a carpenter and joiner and her children were Elizabeth aged 8 and Eva 5. In the 1841 census Alfred Harvey was an 18 year old painter from Westbury on Trym living with his family. His father Job Harvey was a barrister and his brothers were John a bookbinder and Leonard? an accountant. He had four sisters, Sarah aged 25, Mary aged 15, Eliza 12 and Eileen 3. The 1867 rate book suggests that Alfred had moved as he was listed as renting a property now known as 3 St John Street. By 1871 they had moved to 20 Somerset Street in St Paul’s in Bristol. Alfred was still a High Bailiff. Alfred their son was aged 21 and a railway accountant. Their younger son Edward was a railway accountant and organist. Their daughter Ada was an assistant governess aged 17. The youngest child Louisa was still at school. In July 1871 the sale of the house on the east side of Castle Street (probably 42 Castle Street) was advertised in the Bristol Mercury. The house was said to be in the occupation of Thomas Powell. Thomas Powell died on 4th September 1876 aged 63. George Ponting. In 1876 the rate book shows that George Ponting moved into the house. The 1885 rate book shows that George Ponting had continued to live in number 42 but that it was now owned by Mrs Collings. This is because Alfred Collings had died on March 1st 1882 aged 63 years. Henry Blake. By 1890 Henry Blake lived in the house that is now 42 Castle Street which still owned by Mrs Collings. The 1891 census shows that Henry Blake was aged 49 and a labourer from Colerne in Wiltshire. His wife, Mary, was aged 36 and she was from Bristol. Their daughter Winifred was under one year of age. Living next door to them at number 40 was Henry’s son by his first marriage, William Blake aged 23, an engine cleaner from Ford in Wiltshire, with his wife Emily aged 22 who was from Thornbury. Henry and Mary may have married in Barton Regis (a district of Bristol) in March quarter of 1890. This seems to be Henry’s second marriage. His first wife, Mercy Blake, died in Thornbury in the March quarter of the previous year. The 1861 census showed him living with his parents William Blake aged 62 from Wraxall and Dina aged 61. We have been told that Dinah was formerly Dinah Golding. In 1863 Henry Blake married Mercy Knight in the Chippenham area. 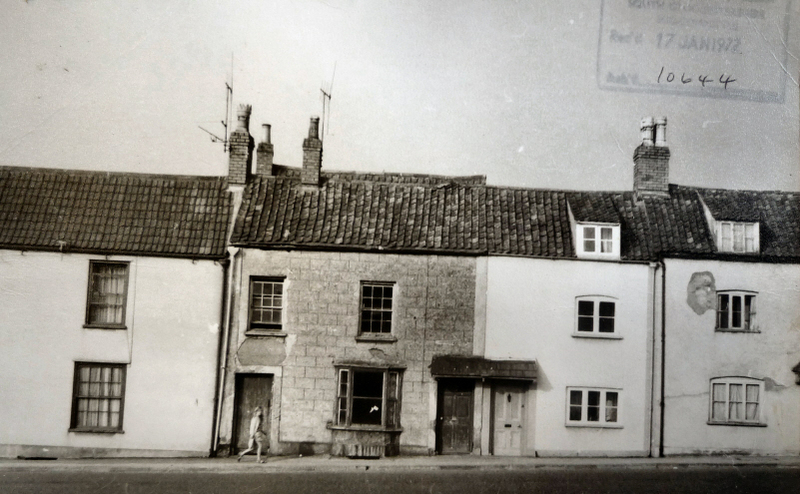 In 1871 they were living in Kington Lane on the edge of Thornbury. Henry Blake was 33 a labourer from Slaughterford. His wife Mercy was aged 28 and she too was from Slaughterford. Edward J aged six and William aged three. In 1881 Henry was 40 and a labourer from Colerne. His wife Mercy was aged 39 and she was from Slaughterford. Their children were 17 year old Edward, a groom, and 13 year old William a scholar. By the 1901 census Henry and Mary Blake had left Castle Street and moved to the outskirts of Thornbury. The census shows they lived in Lower Morton. Henry aged 60 was a farmer and dealer. His wife Mary (from the Redcliffe area of Bristol) was 46. At this time they had three children at home with them; Winifred aged 10, Edith aged 7 and Florence aged 1. Henry Blake died in Thornbury in the June quarter of 1913. 40 Castle Street with its sign between two windows. We believe that this photograph on the left shows the house at about this time. The photograph shows the sign outside the house which was used for the Salmon family’s business. Elizabeth Eddington. By 1905 the house was occupied by Elizabeth Eddington. Elizabeth Eddington died in the December quarter of 1908. The 1910 rate book shows that the house was now occupied by Elizabeth’s son William Eddington. This seems to be a reference to the same well mentioned in the indenture of 1812. Although the house was advertised for sale the rate book of 1925 shows that William Eddington lived in 42 Castle Street and that it was still owned by Mrs Salmon. We also know that William’s first wife Mabel died in the December quarter of 1922 aged 44. The records of St Mary’s Church in Thornbury show that at the age of 51 he remarried on 12th November 1927. His second wife was Rose Fry aged 52, who was a spinster and the daughter of William Fry a farmer. Sadly Rose did not live very long and died in the September quarter of 1929 aged only 54. William’s third wife was Elizabeth James whom he married in the June quarter of 1937. The electoral register shows Elizabeth Eddington lived there in 1965. The photograph on the left shows the house in 1972. It appears to be in quite poor condition at this time but the two doors are still clearly visible. There appears to be another roof immediately behind the main roof which looks like a large extension. We would be very interested to hear more about the layout of the original house. There is no entry for the house in the 1975 directory. It is possible that this around the time that the house burned to the ground and was almost completely rebuilt by Brian Vizard. 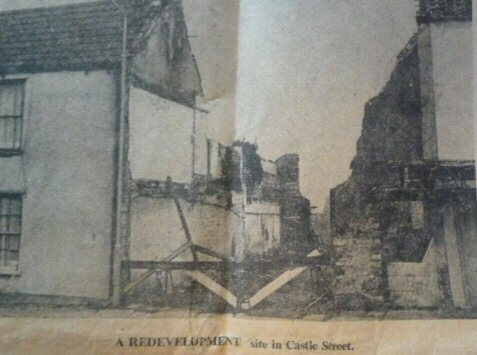 See the site of the burned house in the photograph from the newspaper in 1972. The photograph on the right shows that when the house was rebuilt the extra doorway to the well was no longer needed. The electoral register of 1980 shows Brian and Diane Vizard. Diane will be remembered by many people in Thornbury. She attended Thornbury Grammar School and played an active role in Thornbury activities all her short life.